Mobile customers will be able to switch provider by simply sending a free text message, under major reforms announced by Ofcom today. One of the biggest hurdles in changing provider is having to speak to your current provider, and facing unwanted attempts to persuade you to stay. Ofcom’s changes, which come into effect in 18 months’ time, will give customers control over contact with their existing provider. Under Ofcom’s new rules, mobile providers will also be banned from charging for notice periods running after the switch date. This will put an end to people paying for old and new services at the same time – saving UK mobile customers around £10m in total each year. Bringing in such substantial reforms means mobile operators will need to make a number of changes to their systems, and require coordination between mobile companies. For example, industry will need to set up the new short codes for people to text, and the means to send instant automated responses to switching requests, as well as new billing arrangements to end notice-period double payments. So there will be an 18-month implementation period before this comes into effect, meaning providers must comply by no later than 1 July 2019. Lindsey Fussell, Ofcom’s Consumer Group Director, said: “Too many people are put off by the hassle of switching mobile provider. Our changes will make it quicker and easier for mobile phone users to get a better deal. 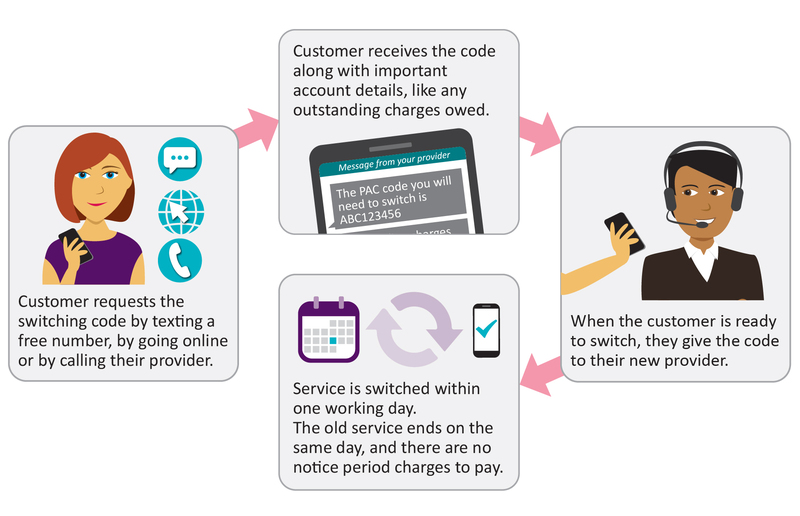 In future, mobile customers will simply request a unique switching code, either by text or online, to pass on to their new provider – who must then arrange for the switch to complete within one working day. People will text one of two memorable short codes, depending on whether or not they wish to keep their existing mobile telephone number. All mobile providers will have to use the same short codes. A customer’s existing provider must immediately respond by text – with either a ‘porting authorisation code’ (PAC) for those wishing to keep their phone number, or a cancellation code for those who want a new number. For businesses, they will get this code within two working days. Because this will be quick and easy, customers could request their code while looking for a new deal – for example, while on the phone to a new provider, or in store. The provider’s reply must also include important information about any early termination charges, outstanding handset costs, or pay-as-you-go credit balances. The unique switching code will be valid for 30 days. A customer will be able to pass the code on to their new provider at the point they place an order for their new service, without the need for any further conversation. Providers will also have to publish and promote clear guidance to help customers follow the new process and make informed switching decisions. Mobile switching reform is part of Ofcom’s wider programme of work to help customers get the best from their phone and broadband. We are also looking at ways to help consumers take full advantage of the choice available; shining a light on how different providers perform in their service quality; and ensuring that people get better information on broadband speeds before entering a contract. Major difficulties include contacting their current provider (11%), cancelling their service (10%), or getting the necessary information from their current provider (9%). Source: Ofcom research. How switching works now: Under the current process, where the customer wishes to transfer their number to their new provider, they usually have to call their current provider to request a 'porting authorisation code' (PAC), and give this to the provider they plan to join. If the customer does not intend to keep their number, and they are on a monthly contract, they must cancel their service with their existing provider and organise a new service with the new provider themselves.